Innovation in aerial robotics is fueling massive growth in the commercial drone industry, which is pegged to reach $1.27 billion by the year 2020— that’s growth of more than double every year. According to the Los Angeles Times, the epicenter of the commercial drone market is in Silicon Valley, and is steered by “geeks working in garages,” rather than grizzled weapon manufacturers like Northrop Grumman Corp (NOC). And like all high-growth industries dealing with revolutionary technological advancements, there’s likely a plethora of companies cropping up. That insane growth is why Sony (SNE) announced its plans to co-venture a commercial drone company with Japanese startup ZMP, Inc, a Tokyo-based robotics company specializing in driverless-car technology. The new entity from the combined companies will be called Aerosense Inc., and will focus on utilizing specially designed autonomous drones to photograph, inspect and survey geographic areas and structures that would ordinarily be difficult to access. 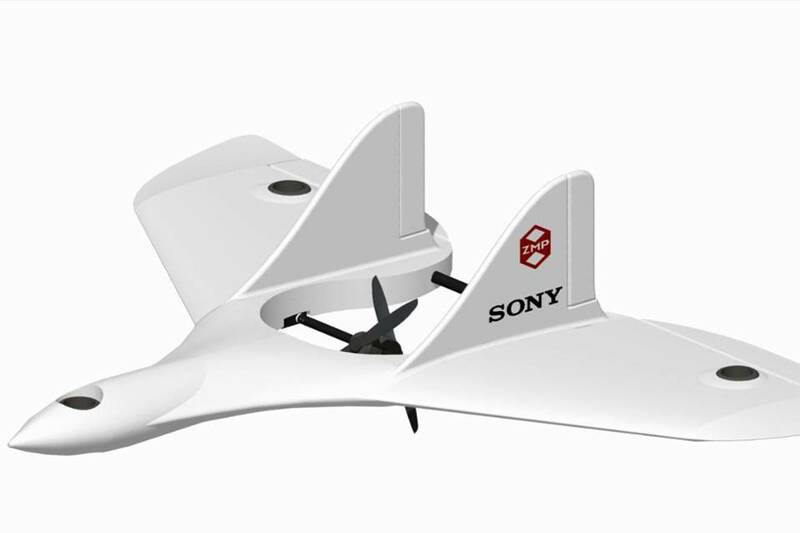 In February, Sony bought a roughly 2% stake in ZMP for $842,000, and plans to advance the development of drones by incorporating Sony’s industry-leading imaging sensors with ZMP’s autonomous robotics expertise. For conservative investors looking to participate in the fast-growing commercial drone arena, there aren’t many alternatives to a 70-year-old $37 billion technology company that’s been a household name for decades — a smart move for investors looking to own a piece of this new market without the risks associated with investing in startups. In May, the Wall Street Journal reported that ZMP launched a related joint venture with another Japanese tech company DeNA Co. to develop robotic taxis and buses. The intention was to combine ZMP’s driverless-car technology with DeNA’s “Internet services know-how” to create a robot taxi company. Sony stock investors could have the advantage of participating in the success — and profits — of these ventures, while remaining shielded from total loss if ZMP’s efforts fail to produce positive results. Sony’s plans are to market and sell its drone services, rather than sell the devices themselves. Sony drones, in that case, wouldn’t directly compete with other tech companies focused on using drones for package delivery and recreational purposes, such as Amazon (AMZN) and it’s Prime Air initiative or GoPro (GPRO) and its Hero4 quadcopter rig. At this time, it’s unclear if Sony plans to market such services in the United States. The use of drones — referred to by the FAA as unmanned aircraft systems — for business purposes requires authorization, and Sony does not currently appear on the FAA’s list of approved commercial operators. Regardless, obtaining FAA approval to use Sony drones should be a simple administrative matter. SNE management doesn’t expect that Aerosense will even be ready to begin operations until sometime in 2016. The real question, however, is whether Sony’s drones will actually generate substantial revenue. SNE stock has struggled over the years, as longtime shareholders once enjoyed prices near $150 per share. Granted, that was more than 15 years ago, but Sony stock is barely eking out a 1% gain over the past five years. However, since February 2012, when SNE management announced Kazuo Hirai as the company’s new CEO, Sony stock is up nearly 60%, thanks in part to the weakening yen and subsequent boom in Japanese stocks. Hirai’s efforts to revitalize Sony’s flailing mobile division, while simultaneously maintaining its cinema and consumer electronics divisions, appear to show signs of potential success. Sony’s devices unit, responsible for the company’s industry-leading image sensors — currently found in both the Apple (AAPL) iPhone and Samsung (SSNLF) Galaxy smartphones — grew by 24% in fiscal 2015 as SNE realized operating income of $776 million, compared to a loss in FY2014. The company’s game and network services unit increased year-over-year sales by 33% primarily due to the large success of PS4 hardware and software Meanwhile, the pictures unit posted an increase in operating income of 13.4%, despite decreases in theatrical revenue stemming from fewer releases. And Hirai has described his intentions to aggressively cut costs and shift focus to SNE divisions that offer the best opportunities for growth. The process will be a long one, and in the meantime the price of Sony stock may not reflect the positive potential of those changes. That being said, it seems entirely feasible that SNE could develop a superb autonomous drone capable of carrying out land surveys, map-making photography, structural analysis and similar data-gathering tasks in harsh geographic regions or otherwise physically challenging environments. And an artificial intelligence-based vehicular joint venture with ZMP has the potential to keep SNE at the forefront of this new market, all the while continuing to reward shareholders in the process.